↑ Benfey, Theodor (1866). A Sanskrit-English Dictionary: With References to the Best Edition of Sanskrit Author and Etymologies and Camparisons of Cognate Words Chiefly in Greek, Latin, Gothic, and Anglo-Saxon (reprint संस्करण). Asian Educational Services. पपृ॰ 453, 464. आई॰ऍस॰बी॰ऍन॰ 8120603702. अभिगमन तिथि 17 January 2016. 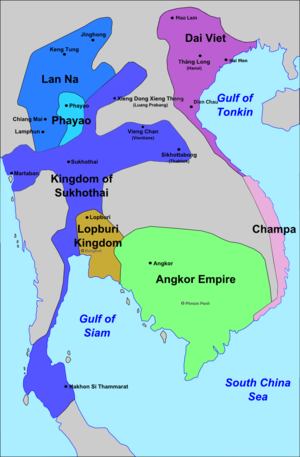 ↑ Evans et al., A comprehensive archaeological map of the world's largest pre-industrial settlement complex at Angkor, Cambodia, Proceedings of the National Academy of Sciences of the USA, August 23, 2007. ↑ Evans, D., Pottier, C., Fletcher, R., Hensley, S., Tapley, I., Milne, A., & Barbetti, M. (2007). A comprehensive archaeological map of the world's largest pre-industrial settlement complex at Angkor, Cambodia. Proceedings of the National Academy of Sciences, 104(36), 14277-14282.